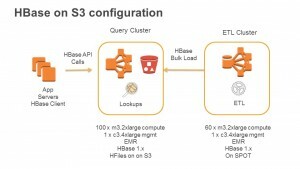 Starting with Amazon EMR 5.2.0, you have the option to run Apache HBase on Amazon S3. Running HBase on S3 gives you several added benefits, including lower costs, data durability, and easier scalability. In this post, I describe how to use some of the common HBase migration options to get started with HBase on S3. Selecting the right migration method and tools is an important step in ensuring a successful HBase table migration. However, choosing the right ones is not always an easy task. The following diagram summarizes the steps for each option. Various factors determine the HBase migration method that you use. For example, EMR offers HBase version 1.2.3 as the earliest version that you can run on S3. Therefore, the HBase version that you’re migrating from can be an important factor in helping you decide. For more information about HBase versions and compatibility, see the HBase version number and compatibility documentation in the Apache HBase Reference Guide. If you’re migrating from an older version of HBase (for example, HBase 0.94), you should test your application to make sure it’s compatible with newer HBase API versions. You don’t want to spend several hours migrating a large table only to find out that your application and API have issues with a different HBase version. The good news is that HBase provides utilities that you can use to migrate only part of a table. This lets you test your existing HBase applications without having to fully migrate entire HBase tables. For example, you can use the Export, Import, or CopyTable utilities to migrate a small part of your table to HBase on S3. After you confirm that your application works with newer HBase versions, you can proceed with migrating the entire table using HBase snapshots. You can create table backups easily by using HBase snapshots. HBase also provides the ExportSnapshot utility, which lets you export snapshots to a different location, like S3. In this section, I discuss how you can combine snapshots with ExportSnapshot to migrate tables to HBase on S3. For details about how you can use HBase snapshots to perform table backups, see Using HBase Snapshots in the Amazon EMR Release Guide and HBase Snapshots in the Apache HBase Reference Guide. These resources provide additional settings and configurations that you can use with snapshots and ExportSnapshot. The following example shows how to use snapshots to migrate HBase tables to HBase on S3. Note: Earlier HBase versions, like HBase 0.94, have a different snapshot structure than HBase 1.x, which is what you’re migrating to. If you’re migrating from HBase 0.94 using snapshots, you get a TableInfoMissingException error when you try to restore the table. For details about migrating from HBase 0.94 using snapshots, see the Migrating from HBase 0.94 section. Launch an EMR cluster that uses the S3 storage option with HBase (skip this step if you already have one up and running). For detailed steps, see Creating a Cluster with HBase Using the Console in the Amazon EMR Release Guide. When launching the cluster, ensure that the HBase root directory is set to the same S3 location as your exported snapshots (that is, the location used in the -copy-to parameter in the previous step). Restore or clone the HBase table from that snapshot. If you’re migrating from HBase version 0.94 using the snapshot method, you get an error if you try to restore from the snapshot. This is because the structure of a snapshot in HBase 0.94 is different from the snapshot structure in HBase 1.x. The following steps show how to fix an HBase 0.94 snapshot so that it can be restored to an HBase on S3 table. Complete steps 1—3 in the previous example to create and export a snapshot. As I discussed in the earlier sections, HBase snapshots and ExportSnapshot are great options for migrating tables. But sometimes you want to migrate only part of a table, so you need a different tool. In this section, I describe how to use the HBase Export and Import utilities. The steps to migrate a table to HBase on S3 using Export and Import is not much different from the steps provided in the HBase documentation. In those docs, you can also find detailed information, including how you can use them to migrate part of a table. The following steps show how you can use Export and Import to migrate a table to HBase on S3. In the destination cluster, create the target table into which to import data. Ensure that the column families in the target table are identical to the exported/source table’s column families. HBase snapshots are usually the recommended method to migrate HBase tables. However, the Export and Import utilities can be useful for test use cases in which you migrate only a small part of your table and test your application. It’s also handy if you’re migrating from an HBase cluster that does not have the HBase snapshots feature. Similar to the Export and Import utilities, CopyTable is an HBase utility that you can use to copy part of HBase tables. However, keep in mind that CopyTable doesn’t work if you’re copying or migrating tables between HBase versions that are not wire compatible (for example, copying from HBase 0.94 to HBase 1.x). For more information and examples, see CopyTable in the HBase documentation. In this post, I demonstrated how you can use common HBase backup utilities to migrate your tables easily to HBase on S3. By using HBase snapshots, you can migrate entire tables to HBase on S3. To test HBase on S3 by migrating or copying only part of your tables, you can use the HBase Export, Import, or CopyTable utilities.